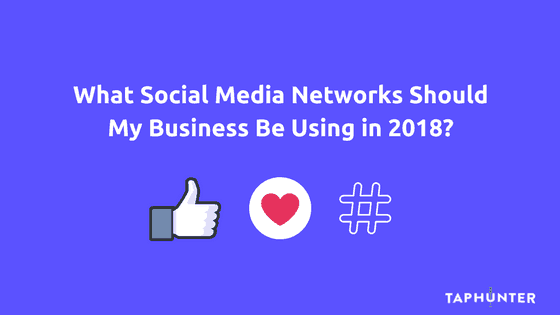 What Social Media Networks Should My Business Be Using in 2018? It’s easy to either ignore social media altogether or go overboard trying to keep up a presence on every network under the sun, but it’s unlikely that either of these strategic extremes is the best option for any bar or restaurant. Finding the sweet spot of social engagement as a business can be difficult, but it’s worth it because finding the right level of participation will help you to be more effective in your social media efforts. So let’s explore this question further – what social media networks should my business be using in 2018? Two of the most important questions to ask yourself as you think about what social networks your business should be active on are – where is your audience and where is your audience searching. These sound like the same thing but they aren’t necessarily the same. The question of where your audience is focuses on where your customers spend most of their time on social media. For most bars and restaurants the answer to this is Facebook, Instagram, and Twitter due to their broad appeal. More focused networks like Snapchat, which is more popular among younger users, may not have enough of your target customers as users. When it comes to what social networks people use to search for a business, this likely has overlap with what networks they use to socialize but they might not be the exact same. For instance, someone might use Instagram to socialize with friends, but when it comes to looking up a business they go to Facebook instead. One great way to learn more about this is to talk to your customers and make an honest effort to understand their habits. Strike up a conversation with someone sitting at the bar and try to learn about how they use different social media sites. Let’s dive in and look at some more specific details of each individual social media network to help you evaluate which are the best fit for you to focus on. Facebook is by far the largest social network when it comes to users and businesses participating on the platform, with 2.2 billion monthly active users as of the fourth quarter of 2017. If there’s one platform that businesses are expected to be on nowadays, it’s Facebook. That’s not to say that there aren’t any drawbacks to Facebook. The social media giant has been increasingly limiting the exposure that brands have in the feeds of those who follow them, meaning that only a small portion of the people who follow a company will actually see their posts. It’s likely that these changes are, at least in part, designed to force brands to pay for advertising to reach the same amount of people that they used to be able to reach for free on Facebook. This doesn’t mean that brands should stop using Facebook, but that they should understand some of the limitations of reach on the platform. Given the widespread use that Facebook has, every business should have a Facebook page so that their customers can find information about them like their business hours and address, especially because users commonly search for businesses on Facebook. It’s also important to engage with Facebook reviews in order to show your customers and potential customers that you care about people having a good experience when they visit your business. In terms of posting on Facebook, we recommend doing so at least 2-3 times per week and considering sharing photos and especially videos, which Facebook prioritizes in the News Feed. One of the next most popular social networks is Instagram. As of September 2017, Instagram had 800 million monthly active users worldwide. The primary focus of content on Instagram is pictures, with every Instagram post requiring an image or video as the central focus of the post. This is different from networks like Facebook and Twitter which allow text-only posts or posts that link off to other websites. Instagram is a great social media network for bars and restaurants to engage on, because there are so many natural opportunities for bar and restaurant employees and owners to take great photos of their business. While users may not always be seeking out businesses in particular on Instagram, if you post great content using hashtags in order to be discovered, potential customers will see what you post and engage with your business. Instagram users may already be tagging photos at your business, and this presents a great opportunity to engage with your customers online. Given the broad reach that Instagram has, and the fact that it is a naturally good fit for bars and restaurants, we would recommend Instagram as one of the most important networks after Facebook to actively post on. Twitter is a platform for sharing bite-sized pieces of content that is well known for the character limits on the posts made on their platform. For much of Twitter’s existence, posts were limited to 140 characters, and even though they recently increased that limit to 280 characters it is still a platform where posts are expected to be short. It’s also normal for people or businesses to post multiple times a day on Twitter due to the high volume of posts being made on the platform. One way to tell if using Twitter is worth your time as a business is looking to see if food and beverage enthusiasts are posting a lot in your area. If you can find hashtags that are relevant to your business (in San Diego we have #sdbeer for instance), then you may be able to tap into some conversations between locals and raise awareness for your business. If you aren’t able to find much of a community on Twitter that is relevant to your business then it may not be worth your time engaging on the platform to the same degree as Facebook or Instagram. With the social media tools included in TapHunter, you can easily streamline posting on Twitter (and perhaps more importantly Facebook) when you update new beers or other menu items. This is a nice lightweight way to participate on Twitter without having to invest a ton of time. For the most part, Snapchat is a network that has been adopted by younger people much more than older people, particularly the 18-24 year old age group. This means that a large number of Snapchat users are not old enough to drink, which is an important consideration for those that sell alcohol (which might be you if you’re reading this post). The main premise of Snapchat is sharing images or videos that disappear after being viewed. This is great for sharing fun moments like a special event where you want to capture the energy and draw someone’s interest. One issue with Snapchat when it comes to bar and restaurant owners is the large number of users under 21 who are engaged on the platform, this is not the demographic that bars are looking to target. Another issue with Snapchat is the fact that Facebook and Instagram have copied much of the functionality of Snapchat, meaning that by posting a story on Facebook or Instagram you are essentially able to communicate in the same way as if you were using Snapchat. For these reasons, it doesn’t make sense for most bars and restaurants to spend time on Snapchat. Let’s be honest, most people who work in the bar and restaurant industry aren’t on LinkedIn. As a social network geared towards professional connections, LinkedIn is also not exactly geared towards bars and restaurants who want to reach potential customers either. While we do think larger corporate entities may want to use LinkedIn to engage professionally, it’s not the best solution for local businesses looking to connect with their customer base. Pinterest is an image-centric social network that was started with the idea of helping people to catalog and share ideas to inspire people to complete real-world projects. Some common examples are cooking recipes, craft-related DIY projects, and other hands on projects. While it’s true that Pinterest is very open and can be used by anyone to make any kind of image and text based post, it is not meant to be a general purpose social network like Facebook or Instagram. 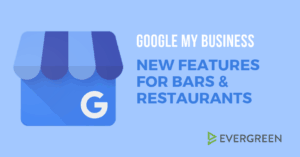 That being the case, bars and restaurants may not be best suited to Pinterest when it comes to connecting with their customer base. To summarize, we recommend that every business definitely be on Facebook at a bare minimum and strongly suggest that bars and restaurants also have a presence on Instagram. Twitter is more subjective based on usage in your area and your ability to keep up with posting. We generally don’t recommend that most bars and restaurants spend time focusing on LinkedIn, Snapchat, or Pinterest due to the fact that the audiences and goals of these networks usually aren’t aligned very well with their target customer base. There are always some differences depending on the focus of your business, so the answer to what social networks your business should be using ultimately depends on what you think is right for your business. One thing that’s abundantly clear is that social media networks provide great free marketing exposure to small businesses everywhere.